Vacation rental townhouse. Sleeps 12, 4.5 bedrooms, 3.75 bathrooms. No pets allowed. A four bedroom townhouse with a den, 3 3/4 baths and two living areas. While here relax on the back deck and enjoy the sound of the small babbling brook nearby; unwind in front of your favorite television program in one of the two living areas or create a meal in the well equipped kitchen… whatever you decide for your White Mountain get-away, you are sure to like the location and spaciousness of this Forest Ridge townhouse. Enter the townhouse to find a den on the right with a queen size futon, television and adjoining full bath. 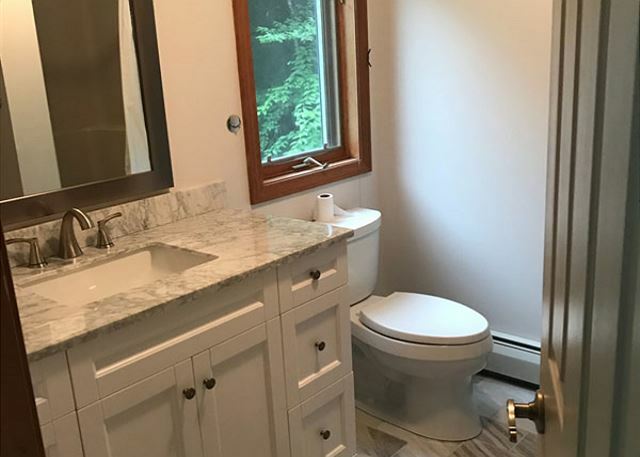 This bath can also be accessed from a hallway just to the other side of the bedroom. Also in this hallway is the laundry closet with full sized stacked HE washer and dryer as well as a spare refrigerator. Straight past the bedroom and hall is the open concept living, dining and kitchen. 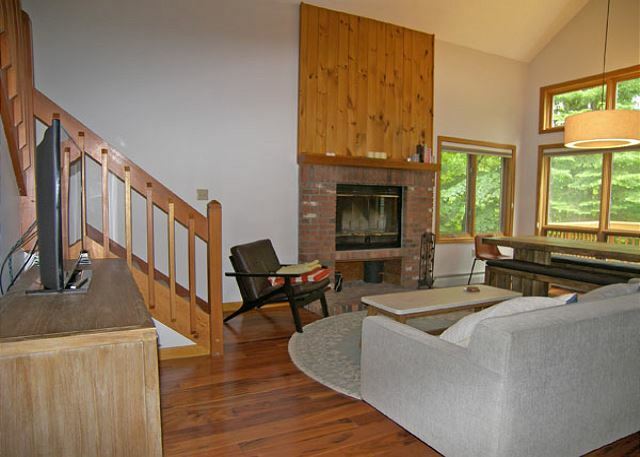 The living area offers a flat screen television with Blue Ray DVD and a wood burning fireplace. The dining area has seating for six to eight with three additional seats available at the kitchen counter. The deck with wooded view is accessed from this area as well. 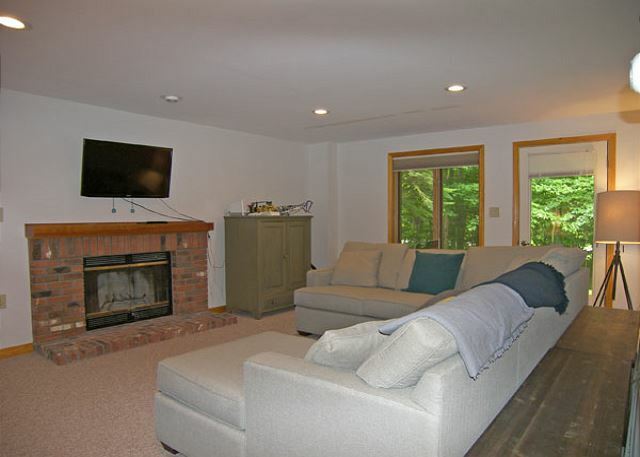 The second living area is located downstairs and also contains a wood burning fireplace and flat screen TV as well as a table for gaming or creating a craft. Also on this level are two bedrooms and a full bath. 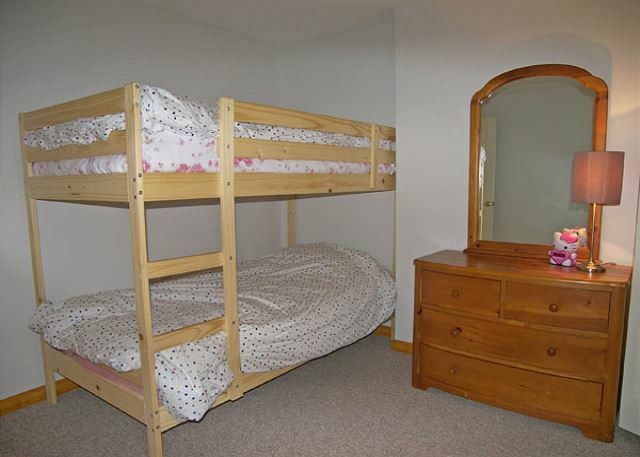 One of these bedrooms has a single set of bunk beds while the other offers two sets of bunk beds. The upper most level of the townhouse, above the entry level, holds two bedrooms each with their own bath. The master bedroom has a king size bed and full bath while the other bedroom has a queen size bed and ¾ bath. Forest Ridge 134-4 is not far from the Forest Ridge Club House, with indoor pool, heated outdoor pool, tennis courts, and a deck over-looking a private pond. *Pet dander may be present in this home. We had 9 family members (our whole clan) staying for the 3 day weekend. The Condo was clean, in very good shape and comfortable for the whole family. The location was very convenient. We made use of the proximity to the Common Man Restaurant on Thursday and we made dinner at the rental Friday and Saturday. In past years we have had other rentals where we found half the furniture was broken and unusable, our rental at Forest Ridge was excellent and we found everything in good shape and clean. This vacation rental was updated and modern. It was very clean. There was enough room for everyone and centrally located. I would recommend this rental to anyone staying in this area. The only suggestions I have is to leave directions to the TV's and the futon. We could not open the futon or work the tv in the lower level. Also there wasn't a remote for the DVD in the living room so we were unable to use the DVD player. 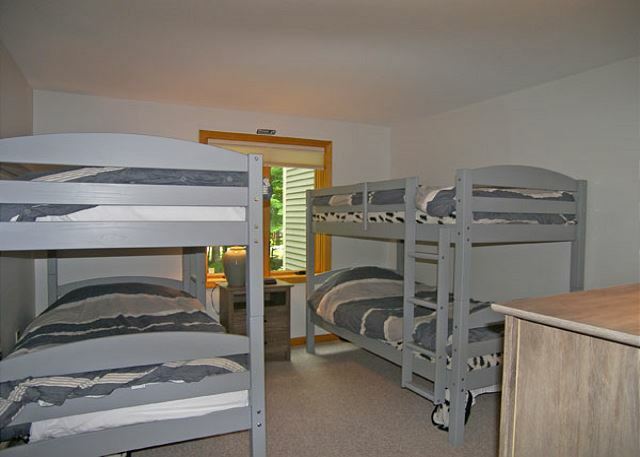 Also, we were lucky it was not to hot the week we were there as the downstairs bedroom with two bunkbeds has no screens in the windows so we could not open the windows!